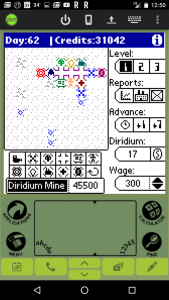 Miner 2149 – A 17 year old PalmOS game on Android – Planet Geek! It’s no surprise that I’m a big fan of retrocomputing, and the associated fun times of retrogaming. Call it being stuck in the past, an over attraction to nostalgia, whatever, but playing around with older stuff can be fun. The first step was downloading PHEM, a PalmOS emulator for Android. This installed without a hitch. Next was getting a ROM. This is a little tricky, as PalmOS roms are technically copyrighted by whomever owns the PalmOS IP, so downloading them isn’t straightforward. I mean, where could you possibly look to find a file called “Palm OS 3.5-en-color.rom” – but somehow I managed to find a ROM. Second step was to find the Miner 2149 prc file. These are usually found in zip files of the same name. See previous paragraph for comments thoughts on locating something like this. Installing prc files into the PHEM emulator takes a moment to figure out, but it’s basically fooling the Sync function in PalmOS to accept a downloaded file as a sync source via the “upload” button at the top of the screen. 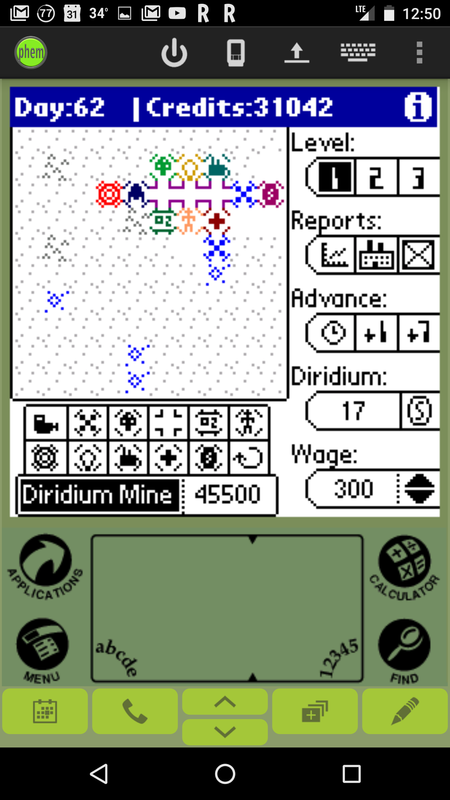 Once that’s completed, it’s just a matter of tapping on the Miner 2149 icon in the emulator, and voila! Instant nostalgia! The game really is as fun as I remember it. I spent about 2 days (okay, evenings… I work for a living) playing it. The first game (pictured above) didn’t end well. Second one went to… well, gosh, this game doesn’t actually have an ‘end’ or win condition that I can tell. I mined every mine and was profitable. At some point I had hoped the game would go “You won!” but that time never came. Now to dig up some other oldies but goodies. Suggestions are welcome!